Unfortunately the switch to the new infrastructure was bumpier than expected. When we finally got everything ready for the switch to the new infrastructure, we discovered that some of the new servers did not match the specs we ordered. We’ve talked to our hosting provider, and they promised to fix this as soon as possible. We sincerely apologize for this delay, but we hope you understand that we cannot control this. The YippieMove website is still working, and you can sign up for new transfers. The only thing that is affected is the actual transfers. Once we get the servers modified to fit our specs, we will have a small amount of downtime (~20 minutes) where we make the actual switch. Today we will have some scheduled down-time for YippieMove. The reason for this is that we are moving to new and faster servers to better handle the increased demand for YippieMove. As a result, we have paused all current transfers. The switch to the new servers will take place sometime today (the exact time depends on when we get them ready) and the downtime will likely last for less than 30 minutes. Once we’ve moved to the new servers, we will resume all transfers. We anticipate that we will be able to improve both the load time on the server, as well as the speed of the transfers. 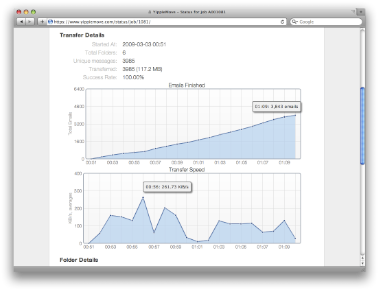 Moreover, the switch to the new servers enables us to scale more seamlessly in the future. Today we are really happy to be able to add support for Yahoo Mail in YippieMove. For the ﬁrst time email can easily be moved in and out of Yahoo Mail accounts. Yahoo Mail, the worldʼs largest provider of email services, does not by itself provide any method for users to transfer email between different accounts and providers. YippieMove breaks down this barrier and enables average users to migrate their own email to or from Yahoo Mail accounts. Since we launched YippieMove, our customers have been asking for support for Yahoo Mail. Today we are finally able to offer our customers this service. While many modern email providers, such as Googleʼs Gmail, have opened up to allow easy access to a userʼs email, Yahoo Mail users are still locked in. This is why we are proud to announce support for Yahoo Mail in YippieMove. Finally, this vendor lock-in is broken, and users are free to move their emails in and out of Yahoo. YippieMove now has a potential reach of over a third of the worldʼs email users. Users can transfer mailboxes to and from Yahoo Mail as well as any of the more than 100 different email providers currently supported. With this new addition to YippieMove, we’ve solved one of the main issues with switching email provider, namely moving the actual emails. With the emails moved, let’s move on to the next problem — incoming mail. The best way to deal with this is email forwarding. Unfortunately this service requires Yahoo Mail Plus which costs $19.95 per year. If you’re not willing to spend that, you can use the free vacation response-feature and write a note telling everyone emailing you that you’ve switched email address. The next thing you might want to move is your contacts. To export your contacts is quite straight forward. 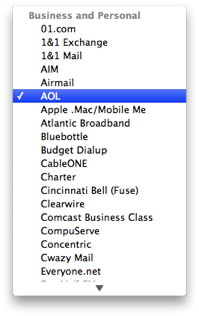 However, in order to access the export feature, you need to switch to Yahoo Mail Classic. Once you’ve exported your contacts you can import that file into your new email provider. Workers United NY NJ, turned to us for their email migration needs. One of their requirements were to be able to move their email without any interruption in their operations. The transfer involved 30 accounts, which was no problems for YippieMove to handle over night. To accomplish this transfer over night, we sent WorkersUnited a CSV-file which the accounts details were filled into. At 10PM ET, we loaded the CSV-file into our system and the transfers started. The next morning in New York-time, all transfers were done. The only thing that was needed to be done the following morning was to update the accounts details in Outlook for the users. It’s hard to make a more seamless switch than this. Today we are very excited to announce YippieMove ’09, our largest update ever to our user friendly online email transfer solution. YippieMove ’09 breaks down email barriers by unlocking transfers from anywhere to anywhere; you can now take your email from almost any IMAP account and shuttle it over to any other account. All this YippieMove does faster while shining with gorgeous new graphs and visuals. The idea of YippieMove is to unlock email and let the user make the switch to another email. When the original YippieMove was released we did just that – as long as you wanted to switch to Gmail. That’s all changed. In YippieMove ’09 any of our pre-configured email providers can now be the destination of your email transfer. You set up a new Zimbra mail account? No problem, we’ll get your old email in there. HyperOffice? Sure, if that’s what you want. Just like usual you can enter your own providers too if you’re a little handy. Speed is up in the new version: through better caching and smart point optimizations in the mover we cut many transfer times in half. Most of you will hardly notice since the previous version of YippieMove routinely chewed through even huge jobs in just a few hours. But for the few of you who carry your whole life memoirs and then some in your inbox, the new version will really race to the finish. To reflect our confidence in the new speedy transfer engine we bumped up all the limits. Transfer twice as many emails and twice as many bytes with this new version: 20,000 emails and 20 GB respectively. The new status page is the coolest new feature. You now get running updates on your transfer job with much more detail than before. What folders have been transferred and which ones are still in queue, what sizes your folders are, how many emails you have. It’s all in there. And since there’s so much data we have distilled it into line charts and bar charts, giving you an easy overview. And it’s still all online. There is no bulky Windows-only resource hogging program to download. Nothing to install. Everything happens in our servers, and with our internet connections. Just fill in your details and you’re good to go. We are really happy with the new version. It’s available today at www.yippiemove.com.